The Cooks Next Door: When It Comes To Eggnog: Go Local! 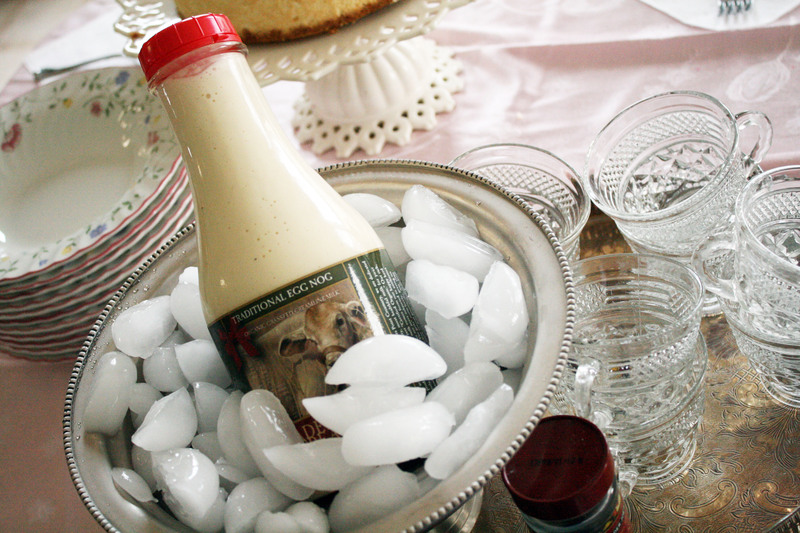 When It Comes To Eggnog: Go Local! I love eggnog -- that combination of creamy, custard flavor and freshly ground nutmeg. For a number of years I've been disillusioned with the eggnog found at chain supermarkets. It's fake color, overwhelming sweetness, and pasty thickness caused me to give up drinking eggnog altogether (unless I invested the time to actually make it myself). This year, thanks to Trader's Point Creamery (Indianapolis, IN), I'm once again indulging in a little eggnog. TPC is a local dairy farm that raises grass-fed cows and sells milk, yogurt, cheese, and ice-cream to supermarkets in our area. My sister brought home some of their eggnog one day and it was an instant hit. It's smooth and creamy, with specks of nutmeg, but not overly sweet, no strange yellow-color, and no hint of what I liken to "cornstarch thickening." If you are in the Indianapolis area, I recommend trying a quart of eggnog (it runs about $5). It's worth the investment and can be enjoyed in small glasses. You might also want to pay a visit to their Farmer's Market, which runs every Saturday morning in the winter (and this weekend and next there is a Christmas on the Farm event too!). If you are outside our area, keep your eyes open for a local dairy that is making their own eggnog from scratch. It just might become a Christmas tradition! I always thought I hated eggnog until I had my mom made homemade eggnog. Delicious! If this is anything like the homemade stuff, I would love to try some. It is absolutely amazing. Rich, creamy, delicious. It's a little thicker than homemade, I think. Do you have a good recipe for homemade eggnog? I'm a little far away from the Indy area and would love to make some. Thanks! I make a lacto-fermented eggnog that my son drinks very often for breakfast (no alcohol). The fermentation takes away the cloying sweetness and adds important probiotics that help him digest all day! Hm, I just remembered I don't have the recipe up on my site. Time to do that. Thanks, next time I'm in IN I'll take a look at Trader's Point.